I had the good fortune of being invited to a cake bake & share (thanks C!) hosted by the lovely L & K who welcomed us into their gorgeous home for an afternoon of fun feastings and taste testing ! Our instructions were simple, cook a cake off a list of suggested recipes, or our own specialty and bring along to share with everyone. Everyone's cake offering's then placed into specific cake type categories: chocolate, carrot, gluten free, banana and other. We were expected to sample each and every cake and then judge the best in each category. Tough gig but we were determined to complete the quest and provide useful feedback! Our arrival was greeted by an overwhelming number of cakes already on display though we had to wait for a few more to appear. Those of us who arrived early had the pleasure of 'looking but no touching' though it was hard on our stomachs which kept growling impatiently and hoping to be let loose. We didn't have to wait long though and L & K did an excellent job of keeping the deliriously hungry mob under control. Armed with our scoring sheets away we went tasteing each others' cakes identified only by a card. As evident from the photos- all the cakes looked fantastic and we soon discovered it would be a tough call on the judging. There were some outstanding efforts, J's Persian Love cake (right) was rich, yet delicate in taste and the personally candied rose petals, hint of rosewater and cardamon really made this exceptional. After the 10th tasting we all started to slow down. Did I hear you say weak? It was not of that we were tired of eating, the serving's were bite size and no one was shying away from indulging in these sweet treats. In reality, the sugar and fat were rapidly increasing our chances of slipping into a hyperglycemic coma!We needed to take a short break... Phew Never thought that eating cake would be so tiring! A breather accompanied with slices of watermelon, and sips of water to cleanse the palette and straight back to it! No rest for these tough cookies! 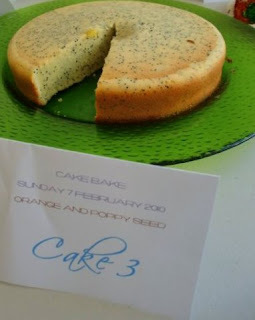 In the orange poppy seed sections there were some mighty efforts including C's homage to pac-man which was bursting with lots of yummy poppy seeds! C's other entry was the 'just for fun' vanilla frosted rainbow cake - an explosion of crazy colours and I suspect a good dose of artificial additives which abet crazy behaviour! With the banana and carrot cake category (sadly didn't get to snap pretty pics) there stand out cakes that were super moist, sweet and fluffy with a lots of gooey banana or grated carrot and cinnamon. The combination of melted mars bar as icing on one of the banana cakes gave it a surprisingly tasty caramel crust- Mmm-mmm! The chocolate cakes were controversial namely because of two entries which were based on a Nigella Lawson recipe but which upon tasting were completely lacking in sweetness. and may have been slightly undercooked. My initial reaction was... 'hmmm interesting...wonder if my tastebuds aren't sophisticated enough to appreciate this taste.' When one of L and K's friends' reaction was an expletive followed by spitting out the rest- we eventually found out this was the cake planted to test our abilities as judges! My offering was a very simple lemon butter cake only I should have soaked it in a super zingy syrup, but decided against doing so because it would mask the texture and taste of the cake. In retrospect, should have done so as despite juice and zest of three lemons the flavour didn't come through strongly enough and I had to renamed it as a butter cake. With the tasting's complete, we waited, rubbing our tummies in defeat while the votes were tallied and the most popular cake announced. I forget which cake ended up being the overall favourite but it didn't matter- a wonderful time was had by all and our tastebuds and tummies were very happy! On a final note L & K are keen to start their own cake business (and this served to allow sampling of various cake recipes for comparison without having to sit down and make each one themselves!) Rightly so too! You can see some of L's amazing sugary creations below- she handcrafted and decorated a birthday cake complete with mini C knitting on top! I can't wait to try one of their cakes once their business is up and running hopefully in the not too distant future, but until then, here's hoping there's another crazy cake cookfest! Thanks L & K! ps. 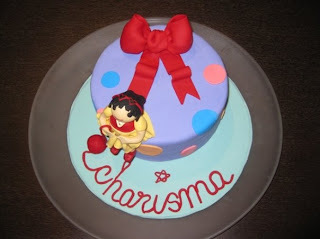 If you are interested in having a cake made and decorated by L & K, leave a comment and I can help connect you with them! at 1:10 am Posted by M? Looks like a great day M's. Hopefully there was some coffee to accompany the cakes! mmm, looks like good fun! Mr delicious blog> Hi! Thanks for dropping by, now can add you to our list of yummy food blogs too! Can you really resist baking cakes for so long? Look forward to reading more of your cooking adventures! Hi Jonno> There was some tea and coffee to go with all those cakes- we were spoilt silly but it was lots of fun! Hi jfox!> Yeah the Rizzo cake was awesome for that reason alone L & K should get into the cake decorating/making business! Was lots of fun and hope to be able to do this sometime soon with you gals too!Hope you're well!! !